Though zpizza is recognized as the original “artisan pizza" on the west coast, the brand experienced a loss of market share and notoriety due to an ever-widening pizza category nationwide. A formidable pizza innovator, zpizza was also first in the category to tackle gluten-free and vegan menu options. However, the brand message wasn’t breaking through and the franchise was all but forgotten on a wider scale. With marketing share increasingly being challenged, zpizza enlisted Grail to bring the brand back to relevance. The task at hand was to help zpizza regain some if its ‘OG swagger’ as a pizza innovator, while developing new creative and identifying the most effective communication pathways for the brand. We began by reworking their brand message throughout zpizza’s digital communications and social media to create a more engaging message. New photography was taken to create more appetite appeal and compete visually in the digital space. We then created and implemented a digital banner media campaign utilizing geo-targeting based on franchisee location and the identified target. The campaign out-performed benchmarks with a CTR nearly double the industry standard, resulting in over 9,000 clicks to the website in less than three months. 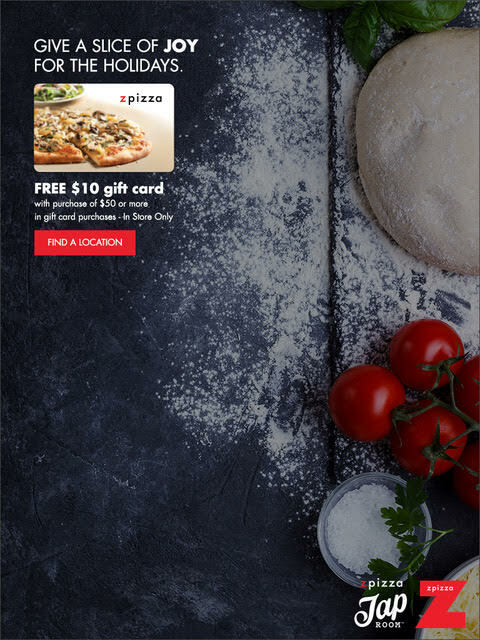 Grail is also involved in overall business strategy, including menu creation as well as fostering marketing partnerships with zpizza ingredient vendors.